Photo of the day: WELCOME TO THE 1964 WORLD’S FAIR 50 YEARS LATER! Photo of the day: WELCOME TO THE 1964 WORLD’S FAIR 50 YEARS LATER! – I had the great pleasure of being one of the thousands that attended the 50th anniversary of the opening of the spectacular and futuristic New York World’s Fair today. 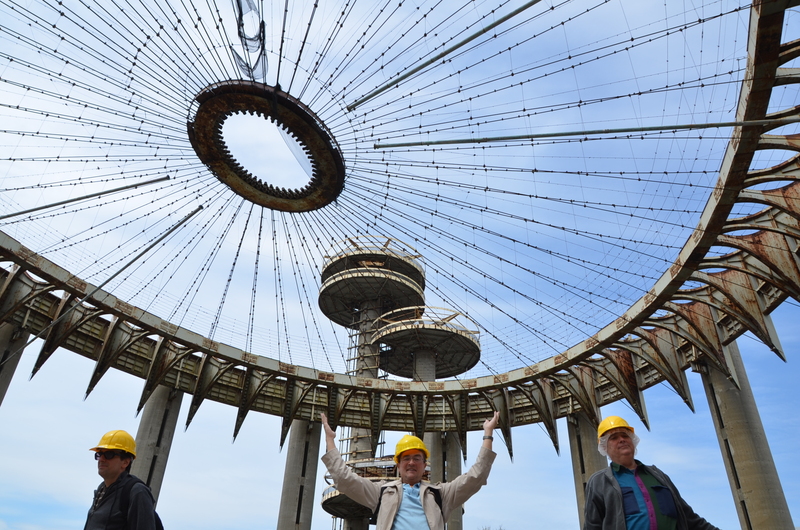 The crowds on a Passover Tuesday were twice what they expected – and I was one of the lucky ones that got in to see the New York State Pavilion, those very George Jetson looking buildings still standing. Some of you may remember it as the 1997 “Men In Black” towers. Mom and my parents took me to the fair several times and to be there today with good friends was surreal. I was even a part of a CBS news feature (video to follow). I took over 500+ photos so it will take me a while to sift, sort and edit since I am touring till Monday. I even have photos of a world champion rock climber climbing the Unishpere! Stay Tuned! This entry was posted on April 22, 2014 by newyorkcityinthewitofaneye. It was filed under DAILY PHOTOS WITH STORIES OF NEW YORK CITY and was tagged with 1964 New York World's Fair, 50th anniversary of the World's Fair, 7 train, George Jetson, Hans Von Rittern, Long Island City Queens, Manhattan, Men In Black, New York City, New York photo, New York State Pavillion, New York World's Fair fifty 50 years later, Photo of the day, photography, Queens, WORLD'S FAIR. Hans I saw you on the news. It was nice Channel 2.